Was looking through the forum, and thought it'll be good to have step by step guide for photo posting. 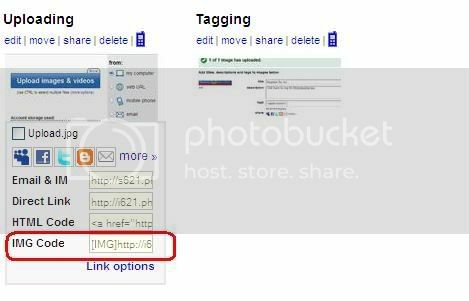 Using photobucket to store and display your pics will help reduce the usage on AF's server space, and it's more or less the same for other forums too! There has been slight changes to photobucket over the years. Move your cursor over the pic to see the links. You may wish to set the album settings to Private, so that when people try to view the pics in your acc, they require a password. This is not a must do step. HOWEVER.. there are some who would prefer their privacy while sharing pics. Can I add another site too? Step 2 - Copy the link inside "Hotlink for forums(1)" or "Hotlink for forums(2)"
Last edited by tiewster; 02-10-2009 at 03:35 AM.